I've mentioned before how I really don't love our master bathroom. Well, with the sale of our house coming up, we decided to finally do something about it. 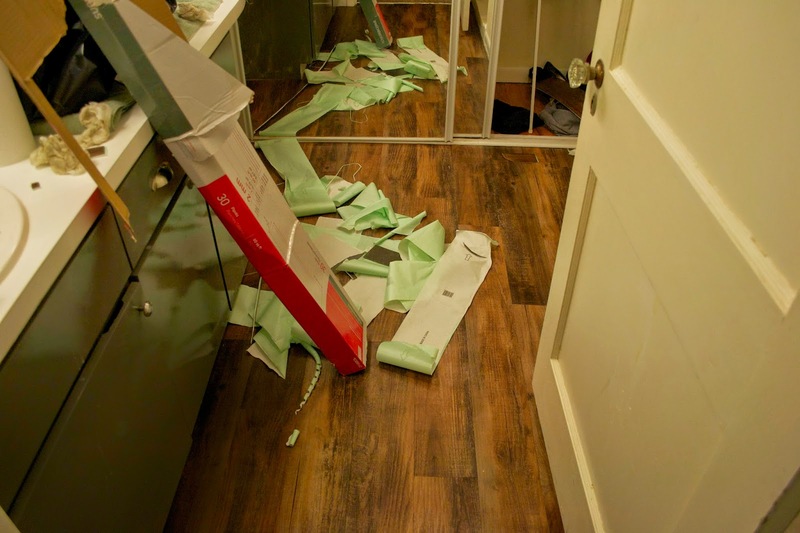 I've already shown you how we took down the builder grade mirror and replaced it with a tile wall. 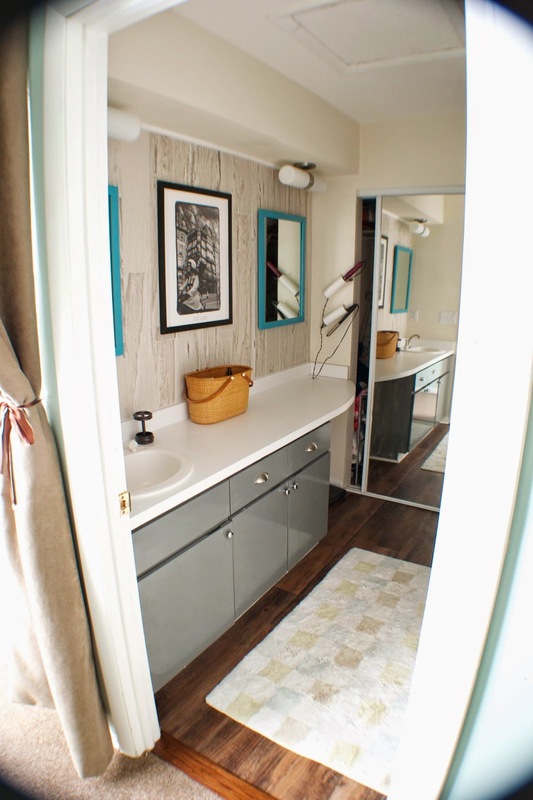 We repurposed the mirror into two smaller mirrors and repainted the vanity. The next thing that needed an overhaul was the floor. Before we owned the house, there was a leak in the shower. 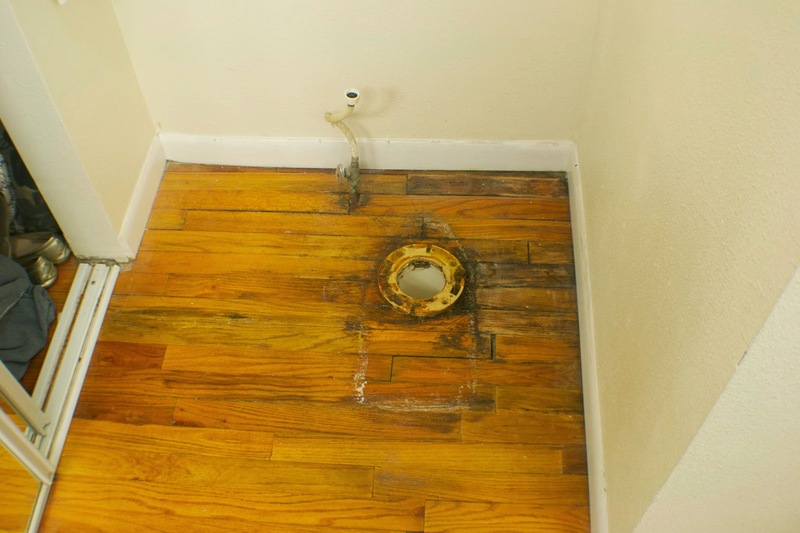 It was fixed but left a lot of water damage on the wood floor surrounding the shower. This made it look horrible and feel wonky. 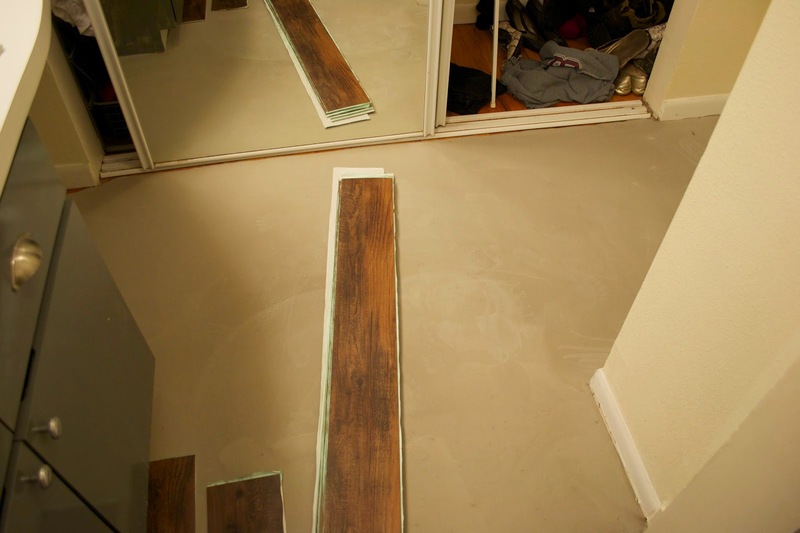 We went back and forth a lot on what we wanted to do with the floor and finally landed on vinyl tile. 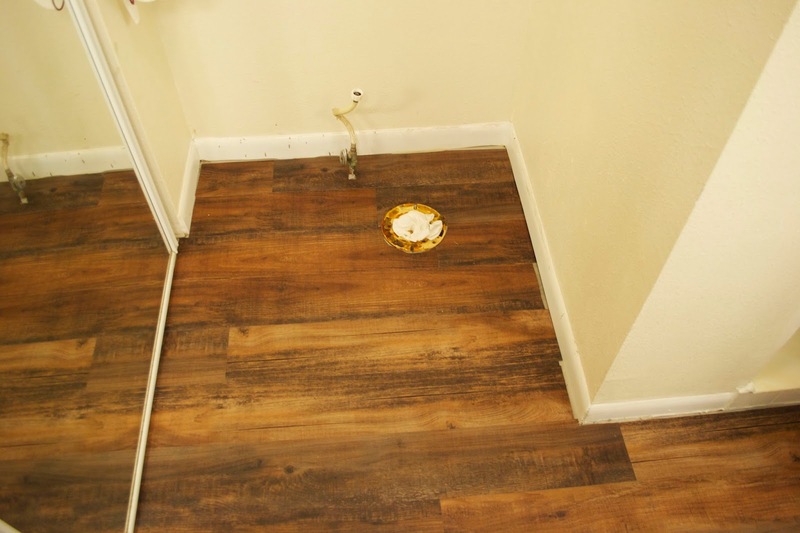 I know what you're thinking, but vinyl tile has come a really long way in the past few years... all the way to wood.... at least a wood look a like. This stuff is gorgeous and it is even textured so that installed it looks like hand scraped wood. 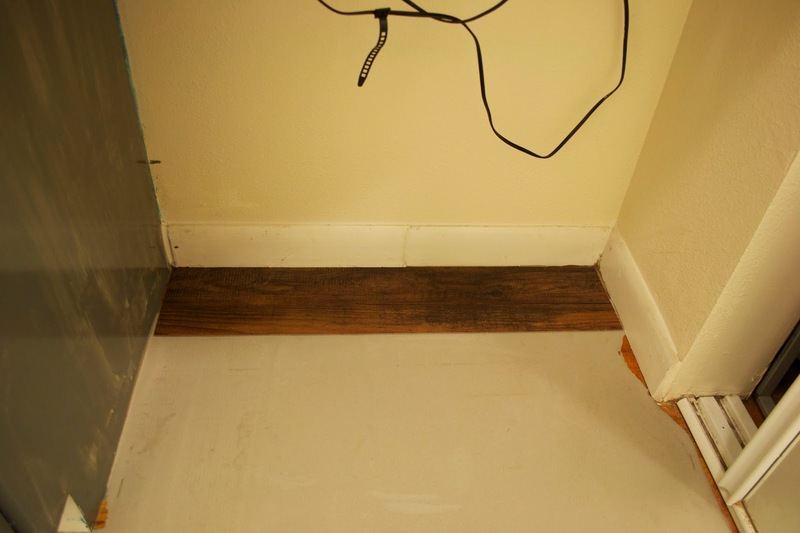 It's amazing and since it's vinyl, you don't have to worry about the water in the bathroom damaging the floor. Win-Win. Oh, and you probably noticed that our old wood floor turned grey. Remember the wonkiness? Well we didn't want that to transfer to the new floor so we mixed up a bag of self-leveler and poured it out on the floor. 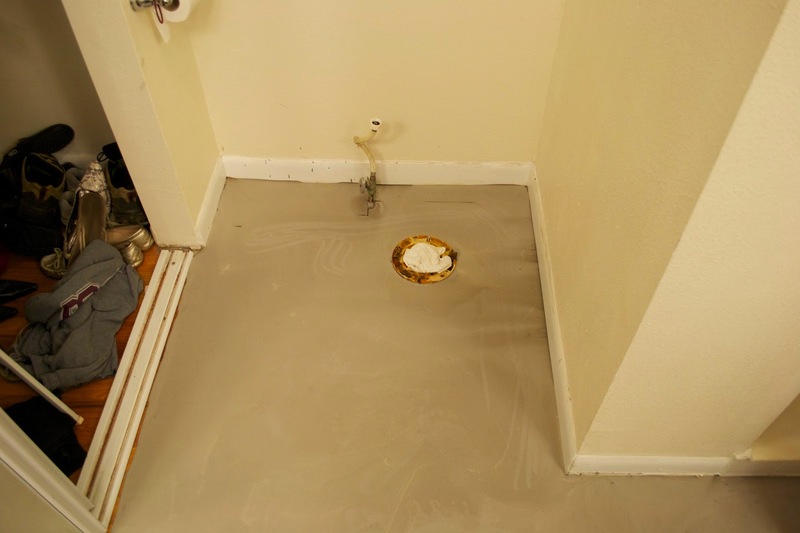 It worked wonders and we checked with the Lowe's guy... you can install the tile right over the self leveler. We used similar peel and stick tiles in our last house with grout. This time, I didn't want any seam lines so everything was installed flush with the other tiles. This stuff is so easy to install. You measure the length of the space and then use a utility knife to scour the front side of the tile at the right length. You can then just snap the tile and it breaks to the right length. 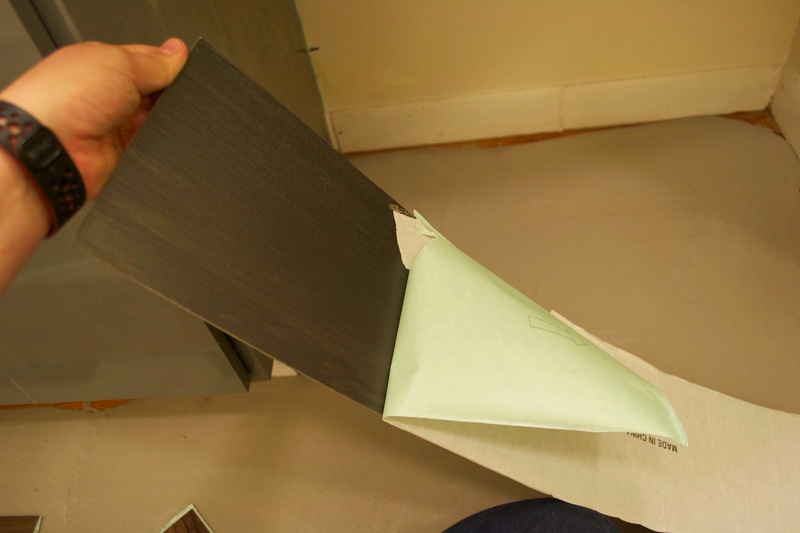 Peel off the back paper, stick it down and apply some nice firm pressure. That's it! I alway put the cut edges towards the wall since we used quarter round to finish the trim. That way, if you don't get a perfect cut, it really doesn't matter. Also, if you scour the back of the tile and snap it, you can damage the front of the tile... like peel off a huge chunk of the vinyl. For this bathroom I used less than one box of tile. 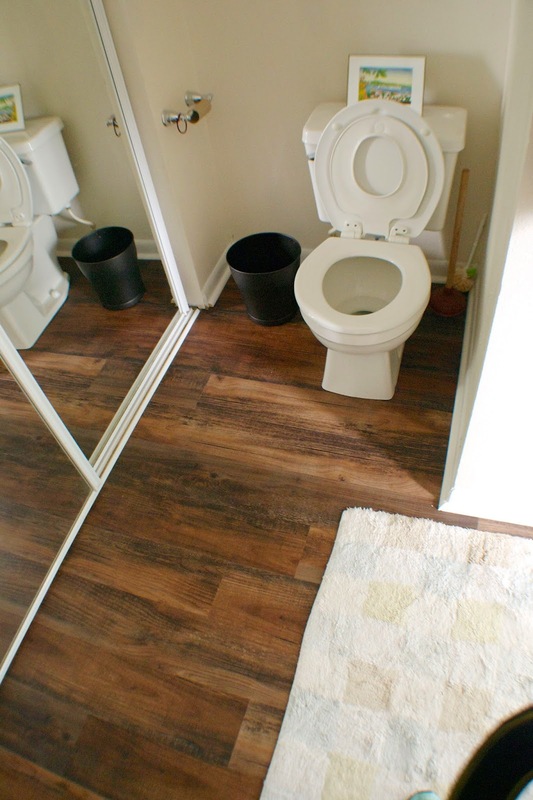 We used Style Selections 6″ wide antique woodland oak luxury plank from Lowe's which we got for $1.19/sq ft. With the self leveler, we spent about $70 on the floor. It took me about 2.5 hours to lay the entire floor after the self leveler was dry. You can see how the edges aren't perfect before the quarter round trim went in but then you can't even tell after. 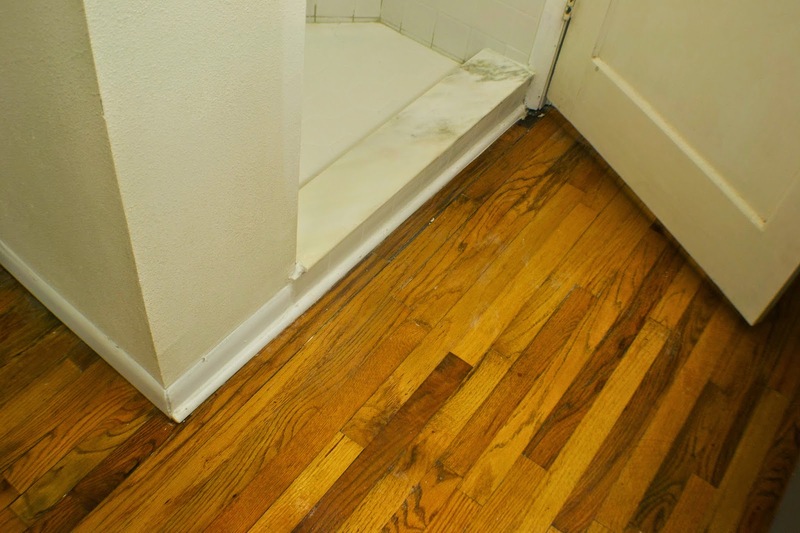 We caulked and painted the trim, added a new threshold, reinstalled the toilet and that was it! 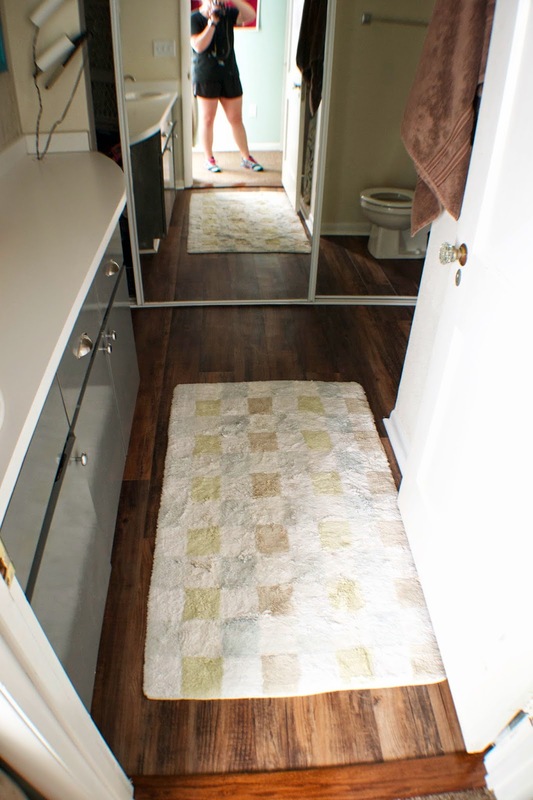 We love the look of the new floor and it makes the bathroom feel new and clean. What do you think? Are you team pro vinyl or con?